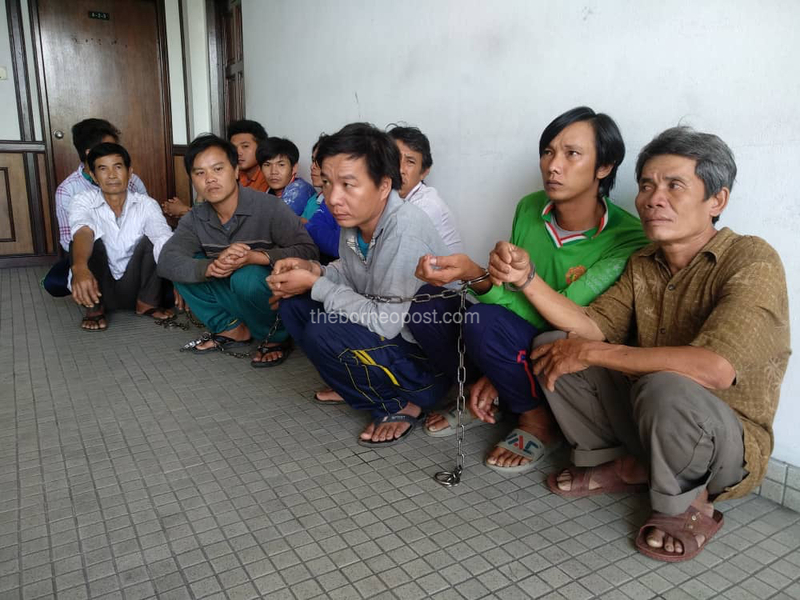 The 13 Vietnamese fishermen who were sentenced to four months’ jail, with nine of them also given one stroke of the cane for entering the state illegally. KOTA KINABALU: Thirteen Vietnamese fishermen were jailed for four months by the Sessions Court here yesterday for entering the state without valid travel documents. Judge Azreena Aziz imposed the sentence on the Vietnamese aged between 18 and 54 after they pleaded guilty to a joint charge under Section 6 (1)(c) of the Immigration Act 1959/63. The charge carries a maximum fine of RM10,000 or a jail term of up to 12 months or both and whipping of not more than six strokes, upon conviction. They were arrested in a foreign boat in the waters north-west of Pulau Balambangan in Kudat at 4.37pm on June 19. The accused, with the exception of four of them who were spared due to their age, were also ordered to be given a stroke of the cane. Meanwhile, five other persons, including four women, were jailed for four and five months for committing a similar offence. They admitted to a separate charge under Section Section 6 (1)(c) of the Immigration Act 1959/63. The judge ordered the man to be whipped once while the women were spared the cane.